I know we’re all tired of hearing the same message every Friday, otherwise known as spirit day, as if we don’t already know we finally get the chance to come out of uniform without consequence. Well, as long as you wear the “approved” clothing. From Monday to Thursday, students are required–or forced, in other words– to wear khaki pants and a green, black or white polo shirt. T-shirts, jackets and hoodies are restricted. On Friday’s, though, we get the chance to a little bit more: Parkdale or college t-shirts or sweatshirts. My question is: why we can’t wear spirit wear everyday ? What is so special about Friday that we’re allowed to wear spirit wear, but we don’t get the same privilege the other days of the week ? As a fourth-year student at Parkdale, I believe if this policy was put into place a lot of students’ attitudes towards school would change. On one hand, students want no uniform, and on the other, administration wants students to follow the uniform policy to a tee. 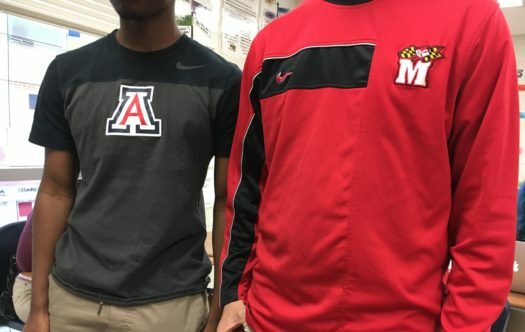 Spirit day everyday could be a reasonable compromise for both parties, especially since many students feel the uniform policy poses a number of problems. Bundu makes a great point. Along with the other uniform restrictions at Parkdale, students are often at the mercy of the weather and the swaying temperature of the building. Allowing spirit wear daily would solve this issue. “I actually love wearing spirit wear,” said Bundu. This love for wearing her college and 2021 shirts could be spread throughout the week. Here’s how daily spirit wear would work: all Parkdale spirit wear is approved tops and bottoms. However strapless or sleeveless tops remain restricted. Spirit wear must be official Parkdale spirit wear either provided by the school, or one of the school’s sports teams. Punishment for not adhering to the policy could include being sent to ALC, and all violators would be on a three strike system with three offenses resulting in suspension from school. Punishments after violation number three will be determined by administration.